Randi Weingarten is president of the 1.7 million-member American Federation of Teachers, AFL-CIO, which represents teachers; paraprofessionals and school-related personnel; higher education faculty and staff; nurses and other healthcare professionals; local, state and federal government employees; and early childhood educators. The AFT champions fairness; democracy; economic opportunity; and high-quality public education, healthcare and public services for students, their families and communities. The AFT and its members advance these principles through community engagement, organizing, collective bargaining and political activism, and especially through members’ work. 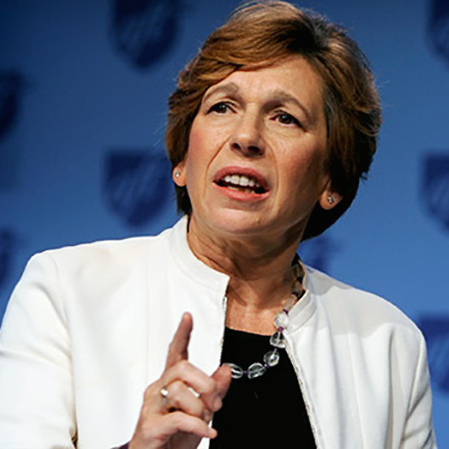 Prior to her election as AFT president in 2008, Weingarten served for 12 years as president of the United Federation of Teachers, AFT Local 2, representing approximately 200,000 educators in the New York City public school system, as well as home child care providers and other workers in health, law and education. In 2013, the New York Observernamed Weingarten one of the most influential New Yorkers of the past 25 years. Washington Life magazine included Weingarten on its 2013 Power 100 list of influential leaders.